From on-air talent contracts and FCC regulations to syndicated program amortization to music licensing fees, electronic media deal with financial principles and jargon that are unique to American business. Understanding Broadcast and Cable Finance helps explain all the financial complexities of a modern electronic media enterprise. 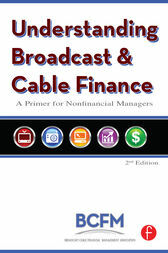 Whether you are a news director, sales manager, engineer or any other non-accounting professional that has a stake in the success of your company, this book will bring you up-to-speed on the essentials of financial management for broadcasting and cable. Broadcast Cable Financial Management Association (BCFM) is a not-for profit professional association dedicated to the unique interests and needs of business and finance executives in the broadcast and cable industries. Founded in 1961, BCFM membership is open to all industry business professionals and media students. In addition, BCFM welcomes associate members from allied fields including: accounting; auditing; brokerage; law; tax; and other related disciplines. The Association's approximately 1,200 active members represent the top financial, station general management, IT, internal audit, human resources, and other broadcasting and cable management personnel from all five major television networks, more than 60% of all network affiliates, at least 4,000 radio stations, more than 30 cable programming networks, and several cable MSOs throughout the U.S. and Canada. Before entering academia, Professor McDowell spent over two decades in commercial television, including station management positions in promotion, programming, and creative services. After earning his doctorate in from the University of Florida, and teaching for several years at Southern Illinois University, he joined the faculty of the School of Communication at the University of Miami in 2001. In addition to teaching various media management courses, Professor McDowell has published media branding studies in several academic publications including The Journal of Media Economics, and the International Journal on Media Management. A nationally known consultant, he also has authored two books published by the National Association of Broadcasters and Focal Press Branding TV: Principles and Practices (with Alan Batten) and Troubleshooting Audience Research. Alan Batten graduated from the University of Maryland (College Park) and undertook postgraduate work at Boston University's School of Public Communications. He has been active in the broadcast industry since 1971 where he had the opportunity to lead the marketing efforts of several stations affiliated with NBC, ABC, CBS, FOX and PBS. Along the way, he served as President of the Broadcast Promotion and Marketing Executives (now known as PROMAX). He has received countless industry awards and presented numerous international lectures on various aspects of broadcast marketing. In 1991, he founded ABCommunications to provide consulting services for marketing challenges. ABCommunications counts as clients such industry giants as Sinclair Broadcast Group, Universal Pictures, ACT III Broadcasting, and Raycom Sports. A writer at heart, he has written several motion picture and television scripts and enjoys producing radio commercials.